During a summer that has seen a string of vehicle-pedestrian and vehicle-cyclist accidents in the city—with 21 fatalities as of June—this study gives new insight into a driver's misallocation of attention when making turns on busy city streets. 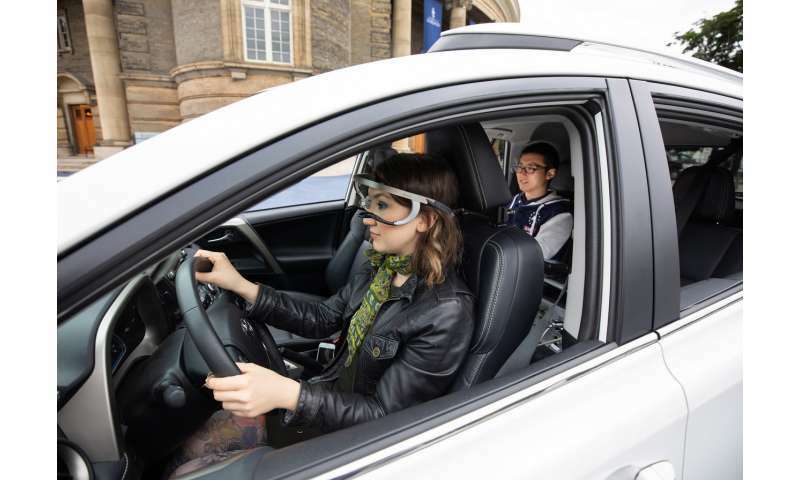 "There are a lot of visual and mental demands on drivers at intersections, especially in a dense, urban environment like downtown Toronto," said Nazli Kaya, who is leading the research under the supervision of Professor Birsen Donmez, Canada Research Chair in Human Factors and Transportation. "Drivers need to divide their attention in several directions, whether it's other vehicles, pedestrians or road signs and traffic signals—traffic safety instantly becomes a major concern," she said. There were more failures turning into Major Street, due to parked vehicles blocking drivers' views of the bike lane. "The results were quite surprising," said Donmez. "We didn't expect this level of attention failure, especially since we selected a group that are considered to be a low crash-risk age group." Donmez believes changes to road infrastructure is needed to improve traffic safety, pointing to the inconsistent implementation of bike lanes as one of the many hazards facing Toronto streets. "I think it's an infrastructure issue. I don't think it's an education issue. When you look at the bike lanes in the city—they appear over here, but disappear there—the more unpredictable the road rules are, the more challenging it is." Until those infrastructure changes are made, "Drivers need to be more cautious, making over-the-shoulder checks, and doing it more often," said Donmez. "The takeaway for pedestrians and cyclists: drivers aren't seeing you. Not necessarily because they're bad drivers, but that their attention is too divided," added Donmez. "When crossing a street, your assumption should be that the car doesn't see you." The study seems to be neglecting the fact that as you approach an intersection, you often already see the cycling lane to the right, and along the crossing street from a distance, and you can see they're empty. No pedestrians can appear out of thin air, so there's no need to look over your shoulder while you're taking the turn. Even if there were pedestrians on the right, and you pass them as you're approaching the intersection, you're in a car moving 20-30 kph faster than the pedestrian. They won't be able to magically teleport in front of you. Yeah Ive been both cyclist and pedestrian and I know enough to look for vehicles turning in front of me at an intersection. That's true but people will see you and cut you off anyway. I just had someone do that to me a few days ago. I was riding my delta recumbent and I sit almost as high as most car drivers do and I have two big red and white striped flags on the back that are pretty hard to miss. The guy drove right past me and then turned right into a parking lot when I was less than 10' from his car and I was going about 15 mph. It didn't do much good for my trike, the side of his car or me. I can't believe he didn't see me. That trike and those flags are simply too big to be ignored in the middle of the day. He didn't bother to use a turn signal either, just cut right into the lot in front of me. We were 'selling' recumbent trikes this morning to visitors from Kalifornistan, mine an ICE and Milady Wife's a Greenspeed - 'tadpoles'. The visitors hit on our conspicuity aids, mine a spin-sock from Catch The Wind and hers a simple orange flag. They evaluated mine 'better' and I asked what is the logical extrapolation of bigger-is-better? I see wedgie roadies with all manner of flashing red and white strobes pointed forward and aft. We have had no memorable close calls in combined forty years of cycling. Doug_Nightmare You two have been very lucky. I don't know where you ride but if you have to ride some main roads like I do I repeat, you have been blessed with luck! You might want to go try a few lottery tickets! Cyclists you are extremely vulnerable, look listen and do not go down the inside of vehicles turning towards you even on a cycle path! This was happening in London, the police and Boris stopped the cyclists going down the inside of buses and lorry and the causalities stopped, although the drivers should look in this case the cyclist lesson was learnt fatally, now heavy goods vehicles have warning sounds and extra mirrors! Granville583762 That works fine if you are in a turning lane or the car driver knows what that little stick on the side of the steering wheel is for and actually uses it so you have some idea of what they are planning to do. Most people don't seem to know what a turn signal is anymore. I can't believe he didn't see me. That trike and those flags are simply too big to be ignored in the middle of the day. Unexpected objects aren't registered correctly by the subconscious observer. You can have all the bells and whistles you want, but it won't register as "This is a cyclist" to a person whose attention is elsewhere because a person on a recumbent bike looks too different. In an uncommon situation like that, you have to apply some cognitive thought to realize that yes, this person is moving forwards towards where his feet are pointing, instead of the usual way, and that doesn't happen if they're not actively looking. The situation would be different if more people were riding tricycles everywhere, every day. Same reason why drivers are blind of motorcycles on the road. They don't look or behave like cars, which they see 99.999% of the time, so it doesn't always automatically register as another motorist. 24volts > Granville583762 That works fine if you are in a turning lane or the car driver knows what that little stick on the side of the steering wheel is for and actually uses it so you have some idea of what they are planning to do. Most people don't seem to know what a turn signal is anymore. 24volts, it cannot be overstated how vulnerable cyclists are as it only takes a touch of wing mirror for death to occur. A cyclist in the right can never take the view their in the right, as car drivers through no fault of their own in that split second fail to see a cyclist; you have to have eyes in the back of your head. Your life is in that split second 24volts, drivers respect and see Hope rear lights made specifically so drivers always see cyclists! You leave hope lights flashing day or night; you are seen before drivers come round the bend, you have to see them to believe them 24volts! The greatest menace on our roads today are cyclists. They believe that NO rules apply to them. I've lost count as to how many times I've seen these jackasses ride into traffic or straight through red lights. Pedestrian rules must be applied to them i.e. they must get off and walk with pedestrians, at every intersection and if there isn't a dedicated cycling path on the road. Where I am, there are clear signs at some bridges indicating that this is what they must do. Yet, every so often, I'll see one of these jackasses ride over the bridge with a grin on his mug. The greatest menace on our roads today are cyclists. They believe that NO rules apply to them. I've lost count as to how many times I've seen these jackasses ride into traffic or straight through red lights. Pedestrian rules must be applied to them i.e. they must get off and walk with pedestrians, at every intersection and if there isn't a dedicated cycling path on the road. Isn't that specified in the law? Where I live that is put in the law. I think you ignore the possibility that there may be a child crossing the streets. Children are small, easily covered by parked cars and they can move very unpredictably. Old people are also a risk because they may not perceive their surroundings well and may end up in a bad place, at a bad time. granville583762 I agree with you on the fact you can never assume a car sees you but when the guy did it to me a while back we were less than a 100' from the intersection that happened to be red at the moment and he was already slowing due to the light. I think the guy cut through that McD's parking lot just to try and skip the light. It's pretty hard to miss two BIG red and white striped flags flapping in the wind. I do have 4 tail lights on the trike too I run all the time when riding but it was about noon so those don't show up all that well. This guy obviously simply didn't give a damn about cutting me off as he zoomed through the parking lot and out the other side once he wrecked me and I really doubt he didn't notice 300+ lbs of me and the trike slamming into the rear quarter panel of his car. When he got home I'm sure he noticed it since there was now a huge dent and scraped up area in the side of that car behind the rear door. I did call the law on him for a hit and run. Gigel, that doesn't apply all the time. I'm disabled and I can't push my trike across the street at intersections. I HAVE to pedal or use the assist motor to get it across. I totally agree with you on the ones that seem to think the traffic laws don't apply to them though. I see them all the time also. I DO happen to obey the traffic laws though except for that one small case and there is nothing I can do about that. About 95% of the time when I see bike riders blow through intersections it will be what I call a lycra rider on a road bike. We have a lot of people that live in the neighborhood that where I do that ride bikes for their main transportation that are not that type and those tend to follow the laws from what I've seen. Eikka, I agree with you on that point mostly, especially if the road has curves on it but this road is only a mile long and straight. You can easily see from one end to the other end. We have a road near me that is full of curves and it has always been dangerous for a bike ride to use it but you could if you were really careful and stayed at the edge of the road. A couple of years ago the city painted bike lanes on it and it's now about 3x as dangerous to ride on as people tend to assume cars won't be in the bike lane but cars come around the blind corners swinging wide and drive right through the bike lanes around the corners ALL THE TIME. We have had more people hit and killed in the last 2-3 years now due to that than in the last 20 years before the bike lanes were added. But you appear to be cycling in a America where the attitude is different 24volt and as your disabled makes speedy getaways difficult, it sounds to me you have not got Hope front and rear lights as everybody goes Wo where did you get these lights from and you tell them from Barnoldswick, Skipton, England - when you put 2 hope vision four on the front and 2 red district on the rear you enter another world where cars respect you as these lights 24volt are on par with Audii lights, to put it simply nice and bright equally day or night! Yea, I might try putting some bigger brighter lights on the back. It certainly couldn't hurt any by doing so. I've got plenty of light on the front already. Maybe run a string of led lights up the flag poles too. You should live where I do. Everyone is stoned, drunk, or tweaking, and bikes are very popular. So are trips to the ER. In my area it's the damn thoughtless overuse of phones and text devices by drivers, cyclists and pedestrians, that seem to contribute to the accident rate. Yeah, I know, don't let a cop catch you in blatant telephony. However chronic budget cuts have seriously impacted the number of patrol cars available to monitor traffic. So the triage of drivers, cyclists and pedestrians try to hide their constant usage with hidden phones, text messaging gizmos held in their laps, bluetooth devices and whatever else available I haven't kept up with. But none of them are paying more than a cursory attention to the road! We have a road near me that is full of curves and it has always been dangerous for a bike ride to use it but you could if you were really careful and stayed at the edge of the road. A couple of years ago the city painted bike lanes on it and it's now about 3x as dangerous to ride on as people tend to assume cars won't be in the bike lane but cars come around the blind corners swinging wide and drive right through the bike lanes around the corners ALL THE TIME. We have had more people hit and killed in the last 2-3 years now due to that than in the last 20 years before the bike lanes were added. Those bike lanes should be taken out, ASAP or better yesterday. It's better without them than with dead cyclists around. Alternatively, mirrors can be placed at dangerous curves and a speed limit can be imposed too. You could write that to the Mayor so that something is done about it. I think you ignore the possibility that there may be a child crossing the streets. When you're approaching a right turn, you can see right into the corner well before you take the turn. Unless the whole place is dangerously cluttered with all sorts of junk, you can see that the street corner and the corner across is empty of pedestrians, children included, for hundreds of yards before you reach it, so why would you look twice? When people see that they can see the street is empty, they'll assume it's empty, because where could the people come from? I'm assuming a situation where there are no parked cars on the right blocking the view to the intersection. If there are, then you need to stop anyways. If I'm not mistaken, it's illegal not to. i biked by a very rare bike death just 2 days ago. a parked uber driver pulled out to his left into a bike lane. the cyclist turned left to avoid, and got hit by a garbage truck on 65th street and central park west in manhattan new york city. the driver was not looking to this cyclist ----from the right. so YES CYCLISTS SHOULD ALWAYS BE ON THE LEFT OF THE DRIVER UNLESS YOU ARE IN ENGLIAND OR A COUNTRY WHERE DRIVERS BLIND SPOT IS ON THE LEFT. so YES CYCLISTS SHOULD ALWAYS BE ON THE LEFT OF THE DRIVER UNLESS YOU ARE IN ENGLIAND OR A COUNTRY WHERE DRIVERS BLIND SPOT IS ON THE LEFT. What do you mean? Bike lanes are on the right side, right? My take is: bikers should cross the street as pedestrians, on their feet, even when there are other ways. Moreover, when you mix cars with bikers or bikers with pedestrians you are essentially cooking a catastrophe. Decades ago when the traffic rules weren't written in stone here, there was a common consensus that pedestrians should travel on the side facing the car traffic, so both parties can see each other approach. This was on country roads where pedestrians travel on the shoulder behind the white line. People found it too scary, so they changed it, and the death toll went up because the pedestrians and bikers often sway into the car lane without looking over their shoulders and get overrun by cars. You still walk against traffic here and ride with it. I don't know where you live that it's been changed but it hasn't been changed here in NC It's been that way here since at least the 60's. That still applies where I live (Eastern Europe), when there is no sidewalk for pedestrians; so if they walk on the road, they should walk on the left side so they see cars approaching (that is the law). However bikers usually go on the right side, the same with cars. The requirement for them is not to ride on the road if there is a practicable roadside. I don't know if they are allowed to ride on the left side. That means a car and a biker go opposite ways with a possibly very high relative velocity. Since the bike lanes in that case are part of the walkway (and not the drive lane) that's not an issue. Of course where bike lanes are part of the car lanes thy are in the same direction.